A Child, a Bride, a Killer? Nigeria's Senate has failed to remove a clause in the constitution which legitimises child marriage. It is time for Nigeria to protect its young girls and fight for equality. In July word spread like wildfire in Nigeria through news websites, blogs, Twitter, and Facebook that the Nigerian Senate had voted to legitimise child marriage. As part of its review of some sections of the Constitution of the Federal Republic of Nigeria, the Senate took a vote on July 16 concerning the removal of clause 29 (4)(b). That clause states that "any woman who is married shall be deemed to be of full age", essentially legitimising child marriages by establishing that any girl younger than 18 is automatically mature enough to handle the responsibilities and realities of marriage by virtue of her involvement in the act of marriage itself. Although the majority of the Senate voted against it, with 60 voting for removal and 35 voting for retention, the total fell short of the 73 votes required to change the Constitution. Child marriage is an institution that infringes upon the rights and freedoms, and damages the health and autonomy, of young girls. If Nigerian citizens want to protect young girls, they must stand against child marriage and call on their Senators and Representatives to do so too, beginning by removing this legitimsation of child marriage in our constitution. The acknowledgement of child marriage would have been on its way out of the constitution if it had not been for the intervention of one particular Senator. Senator Ahmad Sani Yerima of Zamfara West led calls on the floor of the Senate to reject the constitutional committee's recommendation for removing the clause. Yerima, who himself is widely believed to have married a 13-year-old girl in 2009, pushed for a second vote on the matter following an initial vote which had produced the majority required to remove the clause, arguing that under Islamic law a woman is of age once she is married, and that Nigeria cannot legislate on marriages under Islamic rites. Yerima's invocation of Islamic law succeeded in forcing a second vote as President of the Senate, David Mark, recognised the issue as "sensitive". However, the idea that child marriage is sacrosanct in strict interpretations of Islamic law is far from universally accepted. Indeed, it has been compellingly argued, by Maryam Uwais amongst others, that the conditions child brides find themselves in are incompatible with Sharia law, which seeks to promote dignity and justice and prevent harm. Partly for this reason, many Muslim-majority countries - including those for which Sharia is part of the legal or legislative system, for example Egypt - hold 18 as the minimum age for marriage. Child marriage is not a marginal issue in Nigeria. According to the UN, 20% of Nigerian girls are married by age 15. This number rises to nearly 50% in the Northwest region of the country from which Senator Yerima hails. This matters. Practically no married girls aged 15-19 are in school and three-quarters of them are illiterate. The Nigeria Demographic and Health Survey 2008 identified an inverse relationship between the educational attainment of women aged 15-49 years and their median age at first marriage. Lack of education represents a severe challenge to women's rights and freedoms in Nigeria, and can rob young women of economic empowerment, a voice in community issues, and knowledge about reproductive health. Under-educated married girls have lesser autonomy and decision-making abilities than their older male husbands. These educational and power differentials are a detriment to the wider community too, as the education of women has been shown to be decisive in determining social and economic outcomes for developing countries such as Nigeria. The negative consequences of child marriages for girls' health can be direct and immediate. Young girls, whose bodies have not yet fully developed, have a high risk of dangerous complications in childbirth, including obstructed labour, bleeding, and, in some cases, death. Obstructed labour can lead to vesico-vaginal fistula (VVF), a tear in the flesh which results in leakage of urine, and is a condition to which very young mothers are particularly predisposed. Girls who marry young are also more likely to fall prey to sexually transmissible infections (STIs) such as HIV. The continued existence of child marriage in Nigeria also contributes to socioeconomic underdevelopment and the inability of young girls and their children to escape cycles of poverty. Further, it frustrates progress towards many of the Millennium Development Goals (MDGs) including gender equality and the empowerment of women (Goal 3), the reduction of child mortality (Goal 4), and the reduction of maternal mortality (Goal 5). It is crucial that Section 29 of the Constitution of Nigeria be amended to protect the rights of Nigerian girls and facilitate their freedom to develop as productive members of Nigerian communities. Although the bid to change the Constitution failed, the good news is that the majority of Nigerian Senators oppose child marriage. We need to find just 13 more. This is possible. One of the Senators who voted to keep the clause, the Labour Party's Ayo Akinyelure, has said he pushed the wrong button and had intended to vote with the majority to remove the clause. 14 Senators, meanwhile, failed to vote. They must now be lobbied to make up their minds on such a sensitive and important issue. Of the 14, three are particularly crucial. All three of Northern Nigeria's female Senators did not vote. It is time for these three women to take an important stand against child marriage on behalf of their constituents. 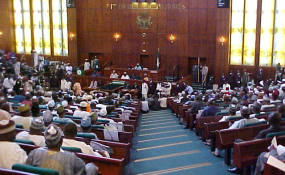 In a bid to maintain pressure on Nigeria's lawmakers, the Gender and Constitution Reform Network (GECORN) sent a letter to the President of the Senate on 24 July 2013, reiterating the importance of deleting the clause. We also need to push for the extension of the Child Rights Act to the 12 states of Nigeria where it is not recognised. Tellingly, in the 11 Northern states that have not passed the act, 27 out of 33 Senators voted for the clause to stay, with only three voting for its removal and three not voting. Jigawa was the only state in the federation with the Child Rights Act where all three Senators voted to keep the clause. We need activism at the state level to push state assemblies to recognise the rights of young girls. These attempts to push legislative action may not have immediate effect in changing the law and the constitution, but they will demonstrate how many Nigerians are setting their face against the practice of child marriage. As it stands, the constitution may still legitimise child marriage, but through our actions, Nigerians can delegitimise this constitutional provision by standing up for a more equal and free Nigeria. The Wellbeing Foundation Africa has launched a petition to remove Section 29 Clause 4(b) from the Constitution of the Federal Republic of Nigeria. You can add your name to it here.